Rebalance, a leading investment firm possessing one of the most experienced and well-known investment committees in the industry, congratulated today Charles D. Ellis, nationally-recognized author and investing authority, on the release of his 17th investment book, The Index Revolution: Why Investors Should Join It Now. In his new book, Charles argues that over the past 50 years trying to beat the stock market has become a “loser’s game.” Wall Street professionals used to do 10% of the trading and now do 99%, and they all have access to the same information at the same time. How do you win this loser’s game? 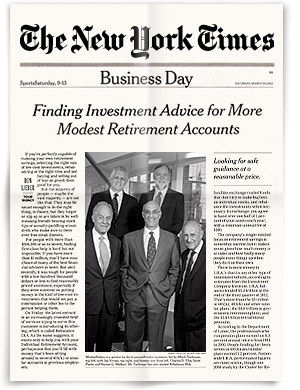 “If you would like to achieve above average investing results, that’s easy; index. In addition, index investing results in lower taxes and less worry.” As Charles explains in his book, no matter what stage of life the investor is in, individuals should take advantage of indexing’s profound benefits, to achieve proven and consistent returns. Dr. Charles D. Ellis is the founder and former managing partner of Greenwich Associates, an international consultancy where he advised large institutional investors, foundations, and government organizations in more than 130 financial markets across the globe. He taught investment management courses at the Yale School of Management and at Harvard Business School. Dr. Ellis sat on the Board of Directors of America’s largest fund company, The Vanguard Group, which manages over $3.6 trillion dollars in assets. In addition, he was a successor trustee of Yale University, where he chaired the university’s famed investment committee with David Swensen. Dr. Ellis also has served on the governing boards of both Harvard and Yale business schools, as well as New York University’s Stern School of Business and Phillips Exeter Academy.